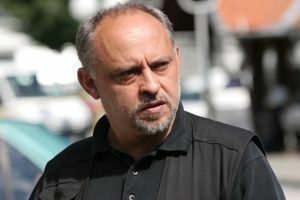 Feri Lainšček, a writer and a screenwriter, was born in 1959 in Dolenci in the North-eastern Slovenian region Prekmurje. Today he lives and works in Murska Sobota. His bibliography comprises more than a hundred books, many of which have been translated into several foreign languages. Feri Lainšček is one of the most popular Slovenian authors. He has received numerous awards for is work. In 1995 his novel Ki jo je megla prinesla was awarded most prominent national award e.i. Prešeren Fund Award. He received Kresnik e.i. an award for the best Slovenian novel twice: in 1992 for the novel Namesto koga roža cveti and in 2007 for the novel Muriša. In 2001 his book of fairytales Mislice was awarded Večernica, which is an award for the best Slovenian youth literary work. Apart from that Feri Lainšček also received Vladimir Slejko Fund Award for his novel Astralni niz and Kajuh Award for his novel Raza and many others awards. Feri Lainšček’s works have been adapted for screen more often than works of any other Slovenian author. Besides Rooster’s Breakfast the following of his novels were adapted for screen: Namesto koga roža cveti (a film and a three-part TV series entitled Halgato), Ki jo je megla prinesla (film title Mokush), Vankoštranc (film title Tractor, Love and Rock’n’roll). His short story Hit poletja was adapted for screen for a TV film with the same title (A Summer Hit). The film is currently in postproduction. In most of the adaptations of his novels Feri Lainšček collaborated as a screenwriter. He is also the author of the screenplay for a documentary feature film about Porabje (the westernmost part of Hungary where Slovenian minority lives) entitled Kak nega zelenoga konja, tak nega čednoga Slovenca. The novel Rooster's Breakfast was published by Študenska založba.